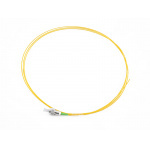 Pigtail is a piece of optical fiber of certain length with solid or unrestrained protective coating 0,9 mm, terminated from one end with a connector of type FC. 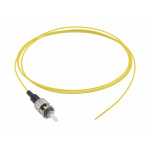 Pigtail is a piece of optical fiber of certain length with solid or unrestrained protective coating 0,9 mm, which terminated from one end with a connector of type LC. Connector LC has a size of standard port of RJ type and ½ of a size of duplex connector SC, which provides high-density positioning, connector LC has a clip in RJ style (the same as a clip on modular copper plugs). 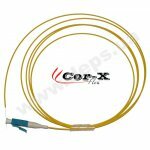 Pigtail is a simplex piece of optical fiber of certain length, with a solid or non-solid protective coating 0.9 mm, terminated from one end with a connector of type ST.
Optical pigtail with reduced bending losses is a simplex piece of optical fiber of certain length with solid or unrestrained protective coating 0,9 mm, terminated from one end with a connector of type FC. 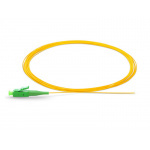 Optical pigtail with reduced bending losses is a simplex piece of optical fiber of certain length with solid or unrestrained protective coating 0,9 mm, terminated from one end with a connector of type LC. Connector LC has a size of standard port of RJ type and ½ of a size of duplex connector SC, which provides high-density positioning, connector LC has a clip in RJ style (the same as a clip on modular copper plugs). 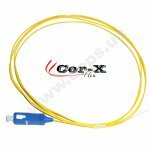 ﻿﻿﻿﻿Optical pigtail is a piece of cable terminated by connector of certain type from one end. Pigtails are mainly used for termination of optical cables in optical distribution frames or optical boxes by welding method or mechanical connection of free pigtail’s end with cable’s optical fiber. Optical pigtail is a piece of cable terminated by connector of certain type from one end. Pigtails are mainly used for termination of optical cables in optical distribution frames or optical boxes by welding method or mechanical connection of free pigtail’s end with cable’s optical fiber. 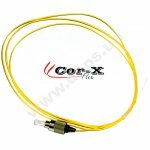 Optical fiber for pigtail can be both single-mode and multi-mode with a connector of type: SC, ST, FC, LC etc. 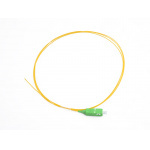 For installation inside the optical boxes pigtails in thick buffer or unrestrained coating Ø0,9 mm are usually used, for outer use – with additional protective coating Ø2 or Ø3 mm.